Description: AYMO at CPF-384. Today's train has two GP9's in the consist. All of the high hoods in this photo have been retired before 2019. Description: The Bucksport Switcher prepares to reverse onto the main after moving off the passing siding in the yard. Description: Switcher #4 has just finished switching the Bishop Street Branchline, and they are now on there way to Rigby Yard, in South Portland. Description: 319 takes AYMO westbound at River Rd in Florida. Description: 319 heads east with MOAY. Description: BFPO heading east to Portland. 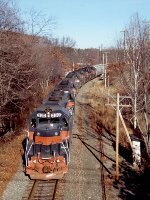 Description: Railroading in New England ! Description: The sound is awesome! I thought they would stall. We could smell the traction moters burning! Description: NS 5357 heading a westbound train. Description: RUED backs down into the yard to make his pick-up. Description: WASE is doing his air test on the "Running Track as SEWA passes by on the mainline at (JK) South Lawrence. Description: With the Connecticut River Line off to the left, MEC 348, MEC 310, and MEC 319 lead train SEED into the East Deerfield Yard. Description: After dropping their train off in the yard, the power off train SEED, consisting of MEC 348, MEC 310, and MEC 319, heads for the pit track. Description: The power off train SEED, consisting of MEC 348, MEC 310, and MEC 319, heads for the pit track after putting their train away. Description: Train SEED, led by MEC 348, MEC 310, and MEC 319, arrives at the East Deerfield Yard. Title: LA-1 moving a tankcar at North St.